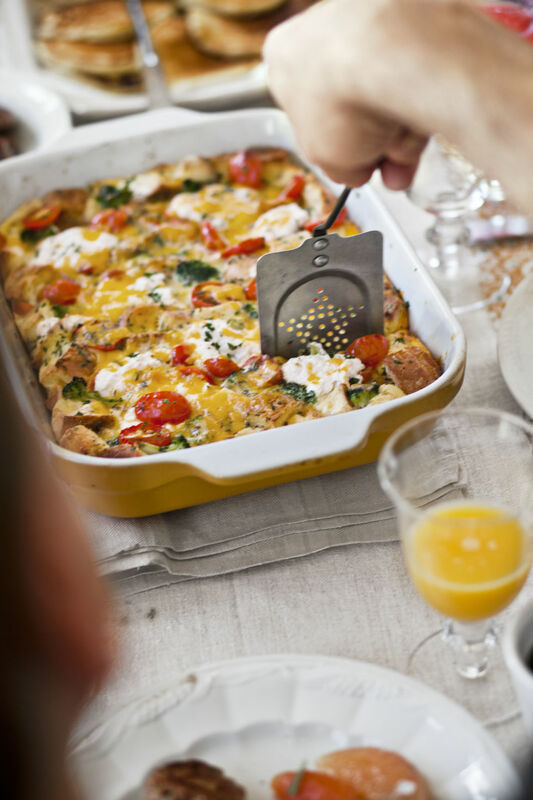 An impressive brunch or dinner dish, strata casseroles are generally assembled the night before their baked, giving the bread time to soak up the dish's flavors. 1. Place bread in a buttered 9- by 13-inch baking dish. Top bread with 1 cup Cheddar, tomatoes, broccoli, and 1 tablespoon parsley. 2. In a large bowl, whisk together eggs, milk, salt, and pepper. Pour egg mixture over bread and gently press to soak every cube. Add dollops of ricotta over top. Sprinkle strata with herbes de Provence and remaining Cheddar. Cover and refrigerate for several hours or up to overnight. 3. Remove strata from refrigerator and bring to room temperature, about 1 hour. Meanwhile, preheat oven to 350 degrees F. Bake until strata is puffed and lightly golden brown, about 1 hour. Set aside to cool for 10 minutes. Garnish with remaining parsley. Serve warm or at room temperature.